Melanomas are highly metastatic cancers that cause the majority of deaths related to skin cancer. Although melanomas are currently not as common as other types of skin cancer, the incidence of melanoma is increasing. Treating metastatic melanomas is extremely challenging, and the cure rate is considerably lower than that of nonmetastatic melanomas. The malignant progression of melanomas is regulated by the differential expressions of several melanoma-related risk genes, such as oncogenes, tumor-suppressor genes, and noncoding RNAs. Thus, elucidating the changes in the expression of the genes and microRNAs may facilitate the understanding and control of melanomas. MicroRNA-21 (also named hsa-mir-21 or miRNA21) is encoded by the MIR21 gene. The expression of microRNA-21 is altered in a wide variety of cancers, and its expression is associated with cancer progression.,, MicroRNA-21 regulates the expression of other genes by targeting the complimentary 3′ UTRs regions of their target mRNAs., Because most of the genes regulated by microRNA-21 are tumor suppressors, microRNA-21 plays an essential role in the malignant progression of various cancers including melanomas.,,, The levels of microRNA-21 were reported to be increased substantially in primary melanoma tissues and human melanoma cell lines compared with benign nevi and melanocytic cell, respectively. A pathological study reported that microRNA-21 expression increased from dysplastic nevi to primary cutaneous melanomas to melanoma metastases and that high microRNA-21 expression was correlated with Breslow thickness, advanced clinical stage, and shorter overall survival of the patients. MicroRNA-21 appears to be overexpressed in human melanomas, and microRNA-21 was shown to regulate the metastasis of B16 melanoma cells by promoting cell proliferation, survival, and the migration and invasion activities. It is known that microRNA-21 targets to the tumor suppressor, PTEN (phosphatase and tensin homology deleted from chromosome 10) and PDCD4 (programmed cell death 4)., The PDCD4 protein is thought to play a role in apoptosis. Is has also been reported that PDCD4 is a eukaryotic translation initiation factor 4A binding protein that inhibits translational activity. PDCD4 was shown to inhibit translation initiation while decreasing the development and malignant progression of tumor in transgenic mice. Moreover, immunohistochemical studies on normal human skin and representative skin lesions indicated that PDCD4 was expressed at lower levels in skin cancers than that in normal skin. PTEN encodes phosphatidylinositol-3, 4, 5-trisphosphate 3-phosphatase, which plays a role in controlling cell proliferation., PTEN is recognized as a tumor suppressor, and a pathological study reported that PTEN was expressed in benign melanocytic tumors but was absent in a large proportion of primary cutaneous melanomas.PTEN is frequently mutated in cancers, and inactivating mutations and deletions in PTEN are detected in several cancer types including melanomas., A previous study has shown that the mutation rates of PTEN were 27.6%, 7.3%, and 15.2% in melanoma cell lines, metastatic melanomas, and primary melanomas, respectively. In this study, we examined the expression of microRNA-21, PTEN, and PDCD4 in normal human keratinocytes, squamous carcinoma cells, melanoma cells, and human melanoma specimens. Our results indicated that although PDCD4 and PTEN are targets for microRNA-21, the regulation of PTEN and PDCD4 expression is more complex in skin cancer cells. The microRNA-21 expression is insufficient to regulate the expression of PTEN and PDCD4 in the skin cancer. Rabbit monoclonal antibody specific to PTEN (138G6) was purchased from Cell Signaling Technology (Danvers, MA, USA). Rabbit monoclonal antibody specific to PDCD4 (EPR3432) was purchased from Epitomics (Burlingame, CA, USA). Anti-β-actin was purchased from Lab Vision (Fremont, CA, USA). Alkaline-phosphatase-conjugated goat anti-mouse and goat anti-rabbit antibodies were obtained from Santa Cruz Biotechnology (Dallas, Texas, USA). HaCaT human keratinocytes, HEMn human epidermal melanocytes, A375 and A2058 human melanoma cells, SCC-4 and SCC-25 human-skin squamous carcinoma cells, and B16F0 and B16F10 mouse melanoma cells were obtained from the American Type Culture Collection (Manassas, VA, USA). The cells were cultured in Dulbecco's modified Eagle's medium supplemented with 10% heat-inactivated fetal bovine serum, 100 U/mL of penicillin, 100 mg/mL of streptomycin, and 2 mmol/L of glutamate; the culture conditions were 37°C under a humidified 5% CO2 atmosphere. The reverse-transcription polymerase chain reaction (RT-PCR) was performed as described previously. Briefly, total cellular RNA was isolated from the cells with the Trizol reagent (Invitrogen, Carlsbad, CA, USA). Reverse transcription reaction was carried out using the First-Strand cDNA Synthesis kit (Fermentas, Ontario, Canada). The reverse transcription reaction mixture (20 μl) containing 1 μg of DNase-treated total RNA, 20 pmol oligo (dT) 18 primer, 50 mM Tris–HCl (pH 8.3), 75 mM KCl, 3 mM MgCl2, 0.5 mM each of dNTP, 1 unit RNase inhibitor, and 200 units/μg RNA of MMLV reverse transcriptase was incubated at 42°C for 1 h. The PCR reaction was done in a 50-μl reaction mixture containing 5 μl of the reverse transcription reaction mixture, 100 ng each of primer, 0.3 mM Tris-HCl (pH 8.0), 1.5 mM KCl, 1 μM EDTA, 1% glycerol, 0.2 mM each of dNTP, and 1 μl of 50× DreamTaq TM DNA polymerase kit (Fermentas). Primers used to amplify microRNA-21 were 5'-GCT TAT CAG ACT GAT GTT GAC TG-3' (sense) and 5'-CAG CCC ATC GAC TGG TG-3' (antisense). Primers used to amplify PTEN cDNA were 5'-TTG GCG GTG TCA TAA TGT CT-3' (sense) and 5'-GCA GAA AGA CTT GAA GGC GTA-3' (antisense). Primers used to amplify PDCD4 cDNA were 5'-CAG TTG GTG GGC CAG TTT ATT G-3' (sense) and 5'-AGA AGC ACG GTA GCC TTA TCC A-3' (antisense). Primers used to amplify GAPDH cDNA were 5'-AGT CCC ACC CCG AAA TTC C-3' (sense) and 5'-CAG CAC CCT GTC CAA AAT CTT-3' (antisense). The expression of microRNA-21 was detected by the GeneAmp PCR System 9700 (Perkin-Elmer, Norwalk, CT, USA) for 28 cycles using the following parameters: 94°C for 30 s, 54°C for 30 s, and 72°C for 45 s with a final extension step at 72°C for 5 min. The GAPDH DNA was amplified for 30 cycles using the following parameters: 94°C for 30 s, 58°C for 30 s, and 72°C for 45 s with a final extension step at 72°C for 5 min. The amplified products were analyzed by agarose gel electrophoresis with ethidium bromide. To quantify the messenger (m) RNA level, a real-time PCR was performed using SYBR® Green Real-Time PCR Master Mixes (Life Technologies, NY, USA) according to the manufacturer's protocol. Real-time PCRs were carried out on a 7300 real-time PCR system (Applied Biosystems). Cells were washed with phosphate-buffered saline (PBS) and lysed in ice-cold radioimmunoprecipitation assay buffer (25 mM Tris-HC1 [pH 7.2], 0.1% SDS, 0.1% Triton X-100, 1% sodium deoxycholate, 150 mM NaCl, 1 mM EDTA, 1 mM sodium orthovanadate, 1 mM phenylmethylsulfonyl fluoride, 10 μg/ml aprotinin, and 5 μg/ml leupeptin). The protein concentrations were determined with a BCA protein assay kit (Pierce, Rockford, IL, USA). Twenty micrograms of each protein sample was loaded onto SDS-polyacrylamide gel. Proteins were transferred to nitrocellulose membranes (Amersham Pharmacia, Little Chalfont, Buckinghamshire, UK). The membrane was blocked at 4°C in blocking buffer (1% bovine serum albumin [BSA], 50 mM Tris-HCl [pH 7.6], 150 mM NaCl, and 0.1% Tween-20) for overnight. The blots were incubated for 1 h at room temperature with primary antibodies followed by incubation with secondary antibodies conjugated to alkaline phosphatase for 1 h. The specific protein bands were visualized by the NBT-BCIP color development. 1 × 105 cells were seeded in 10-mm culture dishes and incubated until confluence. Each confluent monolayer was scratched by the a 200-μl plastic pipette tip to create a wounded cell-free area. The media were discarded, and the cells were incubated in a fresh culture medium. The migratory behaviors of the cells were quantified at several time points during incubation by measuring the distances between the wound edges. Photographs were taken under a phase-contrast microscope. This study was approved by the Ethics Committees of Mackay Memorial Hospital, and all procedures followed guidelines approved by the institutional review board. Human tissue array of normal and melanoma tissues was obtained from US Biomax (Rockville, MD, USA). Immunohistochemistry (IHC) was performed as previously described. Briefly, paraffin-embedded melanoma specimens, nevi, and paired normal tissue sections (6-μm thick) were deparaffinized using xylene and rehydrated using graded alcohol solutions. Antigen retrieval was performed by incubating the specimens in a boiling citrate buffer (10 mM, pH 6.0) for 20 min. The specimens were then treated with a 3% hydrogen peroxide solution in water to block endogenous peroxidase activity and were subsequently incubated in 5% BSA for 1 h at room temperature to block nonspecific staining. The sections were incubated with primary antibodies for 1 h at room temperature, washed 3 times with PBS, and then incubated with a horseradish-peroxidase-conjugated Fab polymer for 30 min. The sites of peroxidase activity were visualized by using diaminobenzidine (3, 3′-diaminobenzidine tetrahydrochloride) as the substrate, and the section was counterstained with Mayer's hematoxylin. The staining intensity was blind rated from 1 (weak staining) to 4 (strong intensity of staining) by a pathologist. MicroRNA-21 plays an essential role in the malignant progression of various types of cancer including melanomas. MicroRNA-21 has been reported to regulate the expression of the tumor suppressors PTEN and PDCD4; however, the expression profile of microRNA-21, PTEN, and PDCD4 in melanoma cells are not fully studied. We examined the expression of microRNA-21, PTEN, and PDCD4 in human keratinocytes, human melanocytes, and skin cancer cells. Our RT-PCR results showed that the precursor of microRNA-21 was expressed at higher levels in A375, SCC-25, and SCC-4 human skin cancer cells than in HaCaT normal keratinocytes [Figure 1]a. For better quantification, we carry out real-time PCR to analyze microRNA-21 precursor expression. The similar result is shown in [Figure 1]b. In addition, we analyzed the relative expression of PTEN mRNA and the microRNA-21 precursor in HEMn (human normal epidermal melanocytes); HaCaT keratinocytes; and A375, B16F0, and B16F10 malignant melanoma cells. 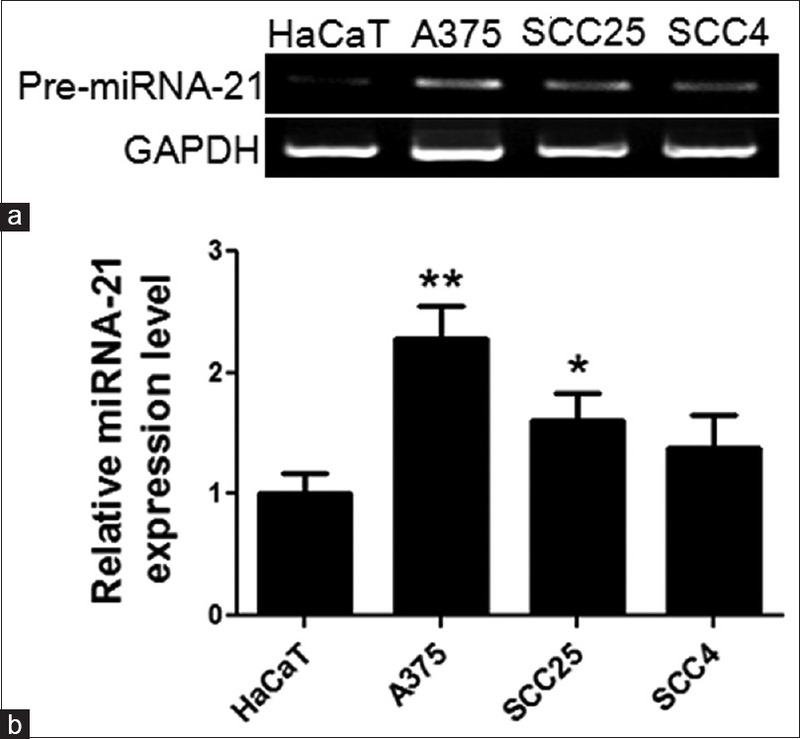 Real-time PCR results revealed that the microRNA-21 precursor was highly expressed in HaCaT, A375, A2058, B16-F0, and B16F10 cells, but it was expressed at low levels in SCC-4 and SCC-25 cells [Figure 2]a. The melanocyte and keratinocyte cells were represented for normal skin cell control. As a result, most of skin cancerous cells, including melanoma and SCC, were expressed similar PTEN mRNA level with keratinocyte and melanocyte. Only the B16-F10 cells expressed lower mRNA level of PTEN. These results indicated that the expression of PTEN mRNA was not inversely correlated with the levels of microRNA-21 in all of these cells [Figure 2]b. To analyze the PDCD4 mRNA expression level in skin cancerous cells, the real-time PCR was carried out to measure the gene expression in melanoma cell lines and skin SCC cell lines. In [Figure 2]c, HaCaT expressed relatively high level of PDCD4. However, the mRNA expression level of PDCD4 in cancerous skin cells was quite diverse. Compared to melanocyte, the expression level of PDCD4 was increased in A375 cell but decreased in B16-F10. 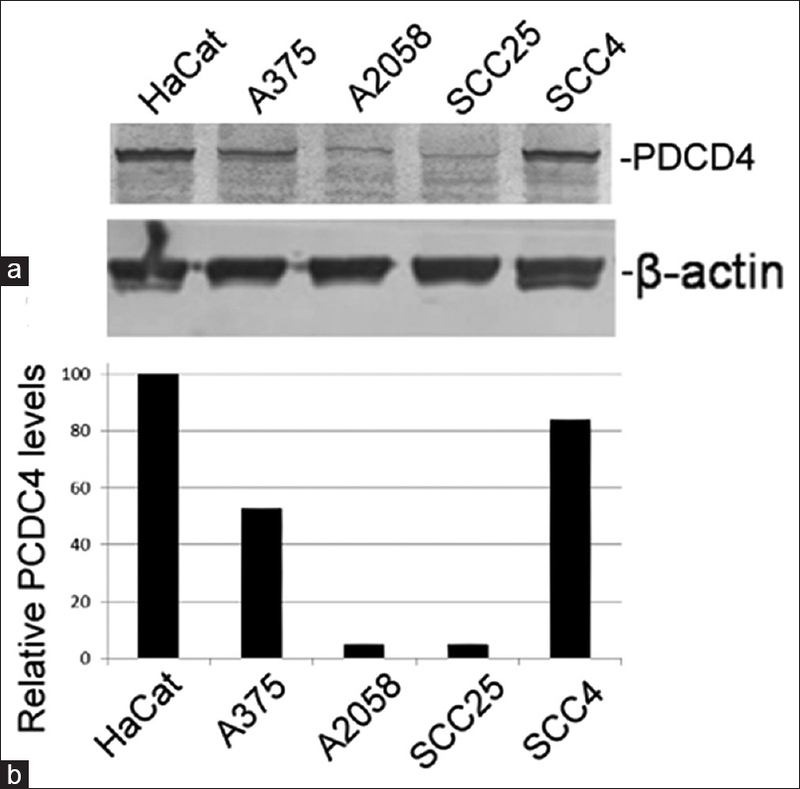 The PDCD4 expression level in A2058, SCC-4, and SCC-25 cells was similar to melanocyte. The declined expressions of PDCD4 in B16-F10 skin cancer cells might be due to the inhibitory effects of microRNA-21. However, there is no negative correlation between PDCD4 expression and microRNA-21 precursor in A375, A2058, B16-F10, SSC-4, and SCC-25 skin cancer cells. Above data suggest that, except microRNA-21, other undefined factors may also be involved in the regulation of PDCD4 in A375, A2058, B16-F0, SSC-4, and SCC-25 cancer cell. Because microRNA-21 targets to both PTEN and PDCD4 and inhibits their expressions, we also examined the expression of the PTEN protein in skin cancer cells. The results of Western blotting showed that although most of the skin cancer cells expressed significant levels of microRNA-21 precursor, only the A2058 melanoma cells exhibited almost no PTEN protein expression and the A375, SCC-25, and SCC-4 skin cancer cells expressed substantial amounts of PTEN [Figure 3]a. 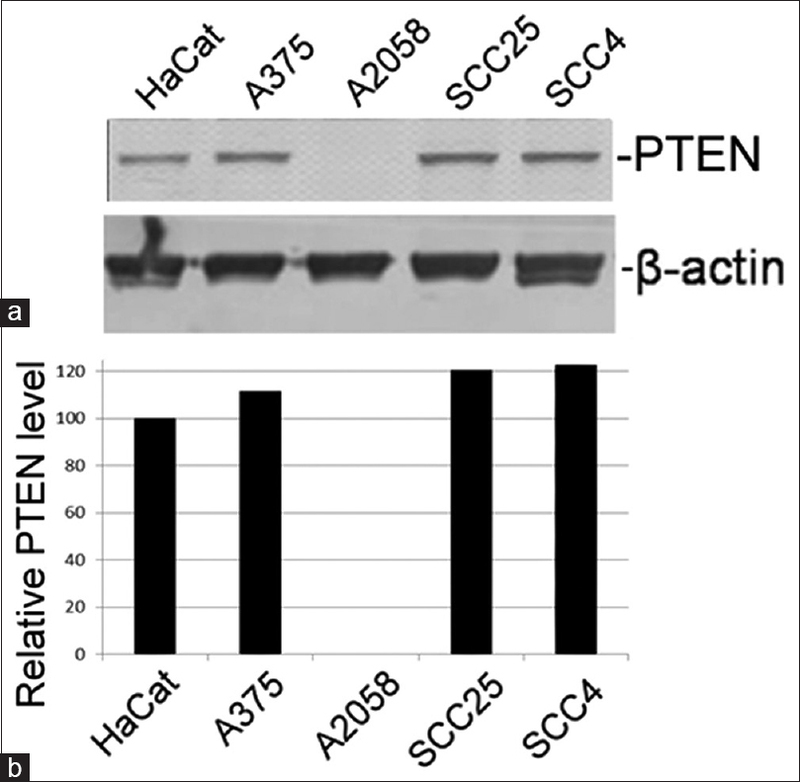 The relative band intensities of the PTEN protein expressed in HaCaT, A375, A2085, SCC-25, and SCC-4 cells are indicated in [Figure 3]b. The lower PTEN level in A2058 melanoma cells may result from the expression of microRNA-21. However, the lack of an inverse correlation between PTEN expression and the levels of microRNA-21 in the A375, SCC-4, and SCC-25 suggests that microRNA-21 was not the only regulator of PTEN expression in these cells. Furthermore, the results of immunoblotting showed that the expression of PDCD4 in A2058 and SCC-25 cells was declined [Figure 4], the protein was expressed at high levels in A375 and SCC-4 skin cancer cells, and the expression of PDCD4 in these cells was not inversely correlated with the expression levels of the microRNA-21 precursor [Figure 4]. B16F10 is a highly malignant mouse melanoma cell line, whereas B16F0 is a weakly malignant mouse melanoma cell line. The results of the wound healing assay showed that the in vitro migration activity of B16F10 melanoma cells was higher than B16F0 melanoma cells [Figure 5]a and [Figure 5]b. The B16F0 melanoma cells expressed a higher level of the microRNA-21 precursor than B16F10 melanoma cells [Figure 2]a. The results of Western blotting showed that both B16F0 and B16F10 melanoma cells expressed PTEN at high levels [Figure 5]c; however, the expression of PDCD4 was lower in B16F0 melanoma cells than in B16F10 melanoma cells [Figure 5]c. Thus, the migration ability and expression of PTEN and PDCD4 was again not inversely correlated with the levels of the microRNA-21 precursor expressed in B16F0 and B16F10 melanoma cells. Our results revealed that the expression of PTEN and PDCD4 was not inversely correlated with the levels of the microRNA-21 precursor in all malignant skin cancer cell lines. Thus, we analyzed the expression of PTEN and PDCD4 in human benign nevi (n = 18) and malignant melanomas specimens, including Stage I melanoma (n = 4) [Figure 6]a, Stage II melanoma (n = 32) [Figure 6]b, Stage III/IV (n = 13), and metastatic melanoma (n = 18) [Figure 6]. By IHC analysis, we found out that the PTEN was faintly stained in several malignant melanomas, and other malignant melanomas exhibited heterogeneous PTEN expression. PTEN staining was strong in certain tumor cells, but the staining was weak or negative in other tumor cells [Figure 6]d. The results of IHC indicated that PDCD4 was heavily stained in human benign nevi [Figure 6]c, and as in the case of PTEN, PDCD4 was weakly stained in several malignant melanomas and exhibited heterogeneous PDCD4 expression [Figure 6]d. The details of IHC staining and clinicopathological characteristics are summarized in [Table 1] and [Table 2]. Most of melanoma specimens expressed higher protein level of PTEN and PDCD4 than benign nevi, especially the early stage melanomas and metastatic melanomas. However, the large individual differences in each stage of melanoma suggest that the PTEN and PDCD4 expressions are regulated in a more complex manner in skin cancer [Figure 6]e and [Figure 6]f.
MicroRNA-21 plays an essential role in the malignant progression of various cancers including melanomas. MicroRNA-21 was reported to target the tumor suppressors PTEN and PDCD4 in melanoma cells. A loss of the microRNA-21 allele was reported to elevate the expression of its target genes including PTEN and PDCD4 and to reduce tumorigenesis, whereas knockdown of microRNA-21 was reported to increase PDCD4 and PTEN expression at the protein level but not at the mRNA level., However, our results indicated that microRNA-21 differentially regulates the expression of PDCD4 and PTEN in skin cancer cells, including human melanoma cells and skin squamous carcinoma cells. Several human melanoma cell lines and skin squamous carcinoma cell lines did not exhibit an inverse correlation between the levels of the microRNA-21 precursor and PTEN and PDCD4, indicating that microRNA-21 was unable to regulate the expression of PTEN and PDCD4 in these cells. Our immunohistochemical analysis revealed that, although staining for PTEN and PDCD4 was strong in several human melanoma tumor samples, several other melanoma tumor samples exhibited heterogeneous PTEN and PDCD4 staining, which was strong in some cases and weak or negative in other cases [Figure 6]. This inconsistent staining pattern of PTEN and PDCD4 in a melanoma tumor mass is not understandable, because the expression level of microRNA-21 in melanoma specimens are different. However, the intermingled PTEN and PDCD4 staining in a melanoma tumor mass might also occur because of the regulatory mechanisms of PTEN and PDCD4 expression in melanomas being complex and not depending solely on microRNA-21. The individual variation of microRNA-21 expression among melanoma tissues had been indicated in our study. All of the melanoma cells in this study also demonstrated high level of precursor microRNA-21, which ranges from 2 to 30 times higher than that of melanocyte. It suggested that there might be some concerns to considering microRNA-21 as a progression biomarker. Besides, researches indicated that microRNA-21 silenced dozens of target genes, including BCL2, TIMP3, TP63, and PPAR. Each of mircoRNA-21-target genes plays an important role in tumor progression. This finding suggests that overexpressed microRNA-21 might enhance malignancy via eliminate various target genes. It has been reported that PDCD4 and PTEN are regulated by various signaling pathways such as Ras-Raf-MEK-ERK pathway, NOTCH1 signaling pathway, and Akt signaling. It suggested that PTEN and PDCD4 expressions are regulated in a more complex manner in skin cancer. Thus, microRNA-21 was not the single regulation factor of PDCD4 and PTEN. MicroRNA-21 regulates the expression of genes by targeting the complimentary 3′ UTRs of their target mRNAs.,PTEN is frequently mutated in cancers, including melanomas,, and PTEN was reported to be mutated at the rates of 27.6%, 7.3%, and 15.2% in melanoma cell lines, metastatic melanomas, and primary melanomas, respectively. These findings suggest that mutations occurring in the 3′ UTRs of PTEN and PDCD4 might eliminate the ability of microRNA-21 to regulate the expression of PTEN and PDCD4 in the melanoma cells studied in this study. In summary, there are four potential factors might affect microRNA-21 regulated PDCD4 and PTEN expression in skin cancer progression. First, the individual variation of microRNA-21 expression in cancer tissues; second, the multiple targets of microRNA-21 in cancer progression; third, the complexity regulation manner of PTEN and PDCD4 expression; and fourth, the mutation rate of PTEN and PDCD4. Our results indicated that although PDCD4 and PTEN are targets of microRNA-21-dependent inhibition, PTEN and PDCD4 expressions are regulated in a more complex manner in skin cancer; the normal PTEN and PDCD4 tumor suppressor functions are not always downregulated in microRNA-21-positive skin cancer cells. The expression of microRNA-21 is frequently increased in various cancers and is a potential target in cancer therapy. Our results provide information that could help in designing strategies of personalized cancer therapy, particularly in the treatment of melanomas. Tzen CY, Wu YH, Tzen CY. Characterization of KIT mutation in melanoma. Dermatol Sin 2014;32:7-12. Pan X, Wang ZX, Wang R. MicroRNA-21: A novel therapeutic target in human cancer. Cancer Biol Ther 2010;10:1224-32. Huang Y, Yang YB, Zhang XH, Yu XL, Wang ZB, Cheng XC. MicroRNA-21 gene and cancer. Med Oncol 2013;30:376. Kumarswamy R, Volkmann I, Thum T. Regulation and function of miRNA-21 in health and disease. RNA Biol 2011;8:706-13. Lu Z, Liu M, Stribinskis V, Klinge CM, Ramos KS, Colburn NH, et al. MicroRNA-21 promotes cell transformation by targeting the programmed cell death 4 gene. Oncogene 2008;27:4373-9. Zhu S, Si ML, Wu H, Mo YY. MicroRNA-21 targets the tumor suppressor gene tropomyosin 1 (TPM1). J Biol Chem 2007;282:14328-36. Jiang L, Lv X, Li J, Li J, Li X, Li W, et al. The status of microRNA-21 expression and its clinical significance in human cutaneous malignant melanoma. Acta Histochem 2012;114:582-8. Saldanha G, Potter L, Shendge P, Osborne J, Nicholson S, Yii N, et al. Plasma microRNA-21 is associated with tumor burden in cutaneous melanoma. J Invest Dermatol 2013;133:1381-4. Satzger I, Mattern A, Kuettler U, Weinspach D, Niebuhr M, Kapp A, et al. MicroRNA-21 is upregulated in malignant melanoma and influences apoptosis of melanocytic cells. Exp Dermatol 2012;21:509-14. Yang CH, Yue J, Pfeffer SR, Handorf CR, Pfeffer LM. MicroRNA miR-21 regulates the metastatic behavior of B16 melanoma cells. J Biol Chem 2011;286:39172-8. Liu CZ, Liu W, Zheng Y, Su JM, Li JJ, Yu L, et al. PTEN and PDCD4 are bona fide targets of microRNA-21 in human cholangiocarcinoma. Chin Med Sci J 2012;27:65-72. He Q, Cai L, Shuai L, Li D, Wang C, Liu Y, et al. Ars2 is overexpressed in human cholangiocarcinomas and its depletion increases PTEN and PDCD4 by decreasing microRNA-21. Mol Carcinog 2013;52:286-96. Afonja O, Juste D, Das S, Matsuhashi S, Samuels HH. Induction of PDCD4 tumor suppressor gene expression by RAR agonists, antiestrogen and HER-2/neu antagonist in breast cancer cells. Evidence for a role in apoptosis. Oncogene 2004;23:8135-45. Yang HS, Jansen AP, Komar AA, Zheng X, Merrick WC, Costes S, et al. The transformation suppressor pdcd4 is a novel eukaryotic translation initiation factor 4A binding protein that inhibits translation. Mol Cell Biol 2003;23:26-37. Jansen AP, Camalier CE, Colburn NH. Epidermal expression of the translation inhibitor programmed cell death 4 suppresses tumorigenesis. Cancer Res 2005;65:6034-41. Matsuhashi S, Narisawa Y, Ozaki I, Mizuta T. Expression patterns of programmed cell death 4 protein in normal human skin and some representative skin lesions. Exp Dermatol 2007;16:179-84. Chung JH, Eng C. Nuclear-cytoplasmic partitioning of phosphatase and tensin homologue deleted on chromosome 10 (PTEN) differentially regulates the cell cycle and apoptosis. Cancer Res 2005;65:8096-100. Groszer M, Erickson R, Scripture-Adams DD, Dougherty JD, Le Belle J, Zack JA, et al. PTEN negatively regulates neural stem cell self-renewal by modulating G0-G1 cell cycle entry. Proc Natl Acad Sci U S A 2006;103:111-6. Tsao H, Mihm MC Jr., Sheehan C. PTEN expression in normal skin, acquired melanocytic nevi, and cutaneous melanoma. J Am Acad Dermatol 2003;49:865-72. Abdel-Rahman MH, Yang Y, Zhou XP, Craig EL, Davidorf FH, Eng C, et al. High frequency of submicroscopic hemizygous deletion is a major mechanism of loss of expression of PTEN in uveal melanoma. J Clin Oncol 2006;24:288-95. Zebary A, Omholt K, Vassilaki I, Höiom V, Lindén D, Viberg L, et al. KIT, NRAS, BRAF and PTEN mutations in a sample of swedish patients with acral lentiginous melanoma. J Dermatol Sci 2013;72:284-9. Aguissa-Touré AH, Li G. Genetic alterations of PTEN in human melanoma. 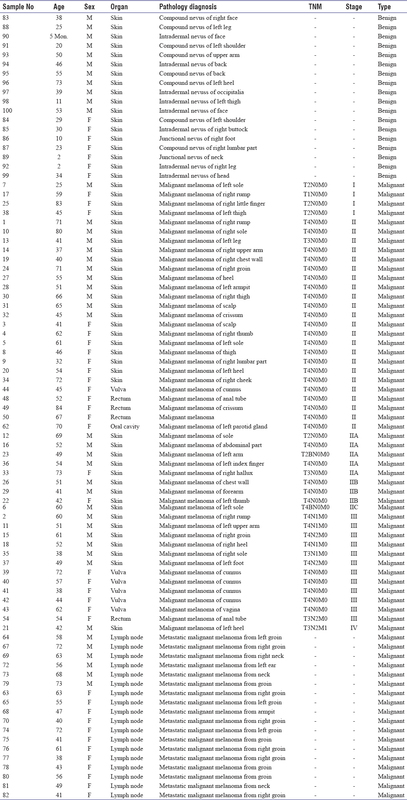 Cell Mol Life Sci 2012;69:1475-91. Tai CJ, Shen SC, Lee WR, Liao CF, Deng WP, Chiou HY, et al. Increased cellular apoptosis susceptibility (CSE1L/CAS) protein expression promotes protrusion extension and enhances migration of MCF-7 breast cancer cells. Exp Cell Res 2010;316:2969-81. Liao CF, Lin SH, Chen HC, Tai CJ, Chang CC, Li LT, et al. CSE1L, a novel microvesicle membrane protein, mediates ras-triggered microvesicle generation and metastasis of tumor cells. Mol Med 2012;18:1269-80. Ma X, Kumar M, Choudhury SN, Becker Buscaglia LE, Barker JR, Kanakamedala K, et al. Loss of the miR-21 allele elevates the expression of its target genes and reduces tumorigenesis. Proc Natl Acad Sci U S A 2011;108:10144-9. Gu L, Song G, Chen L, Nie Z, He B, Pan Y, et al. Inhibition of miR-21 induces biological and behavioral alterations in diffuse large B-cell lymphoma. Acta Haematol 2013;130:87-94. Buscaglia LE, Li Y. Apoptosis and the target genes of microRNA-21. Chin J Cancer 2011;30:371-80. Galan JA, Geraghty KM, Lavoie G, Kanshin E, Tcherkezian J, Calabrese V, et al. Phosphoproteomic analysis identifies the tumor suppressor PDCD4 as a RSK substrate negatively regulated by 14-3-3. Proc Natl Acad Sci U S A 2014;111:E2918-27. Bermúdez Brito M, Goulielmaki E, Papakonstanti EA. Focus on PTEN regulation. Front Oncol 2015;5:166. Vikhreva PN, Korobko IV. Expression of pdcd4 tumor suppressor in human melanoma cells. Anticancer Res 2014;34:2315-8.